A new study assessing the influence of species diversity of canopy trees on the amount of ozone precursors a forest emits suggests that atmospheric chemistry models in use now may underestimate the importance of tree species mix and size to ozone pollution, says lead author Alexander Bryan, a postdoctoral fellow in the Northeast Climate Science Center at the University of Massachusetts Amherst. Details appear in an early online edition of the journal, Atmospheric Environment. As Bryan explains, "Ozone pollution models do really well at predicting air quality in urban areas because that's where the problem started. Our atmospheric chemistry models have all been tested and optimized for urban air quality studies. But when we try to put those same models to the test in the forest regime without cars and factories, the models break down." Current models usually represent the forest as a single dominant tree species or a blend of a few, so they may not capture the right mix of compounds emitted from trees and their oxidation products, he says. "The lesson from this study is that we may need to include more complexity in modeling," he says. Even with this clue on how models might be improved, Bryan and colleagues note, the magnitude of natural volatile organic compound (VOC) emissions is still "highly uncertain due to the complexity of emissions and chemistry" in forested areas. Forest trees naturally emit the biogenic VOCs monoterpenes and isoprene, two main pre-cursor ingredients that combine in the atmosphere with nitric oxide (NO), which is emitted mainly by soils, to form the pollutant ozone. NO was once found in very low concentrations in the air until industrialization and human activities such as driving trucks, trains and cars changed atmospheric chemistry, Bryan says. For this study, while he was a doctoral student of Allison Steiner, a biosphere-atmosphere interactions expert at the University of Michigan, Bryan used data collected by others on the ratio of tree species within a 197-foot (60-meter) circle at the university's biological station in the northern Lower Peninsula. He also measured the height of 248 broadleaf and needle-leaved trees in the circle. Broadleaf trees such as aspen and oak emit isoprene as a function of light and temperature, while most needle-leaved trees emit monoterpenes as a function of temperature only, he points out. This is important because forest light varies due to shade from leaves and branches, "so the vertical location of broadleaves and needle-leaves likely matters for how much they emit," he explains. Bryan and colleagues used tree height data to add vertical layering to their emissions model then conducted simulations using two different emissions schemes. One simulated a homogeneous mixture of broadleaf and needle-leaved trees, with vertically uniform emission potentials. 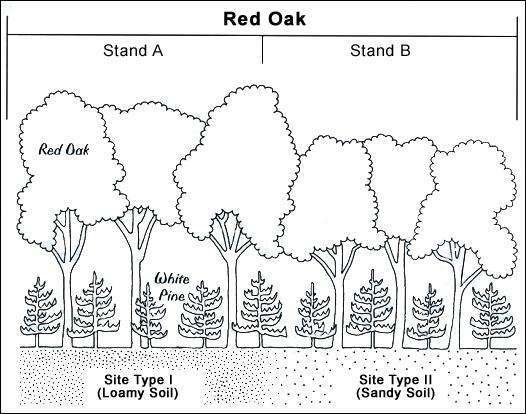 The other case includes a heterogeneous or mixed canopy with emission potentials that varied with the proportion of foliage from each tree species at each model layer. Emission potentials are then converted to emission rates the same way in both simulations using the same daily cycle of light and temperature, a control that allowed the researchers to isolate the effect of different leaf type distributions. Bryan says, "We found that in modifying these models, it may be important to represent as realistically as possible how leaf type changes throughout the height of the forest. You need to know how many tall trees there are, how tall they are and what percent of the forest they represent, because these are the trees which receive the most light and thus have the greatest potential for emitting ozone precursors." Overall, findings "highlight the importance of adequately representing complexities of forest canopy structure when simulating light-dependent biogenic VOC emissions and chemistry," the authors state. They also simulated a homogeneous and heterogeneous canopy with aspen and birch removed to assess the impact of canopy heterogeneity on projections of biogenic VOC chemistry in late-successional forests. They found that VOC emissions declines from aspen loss were 10 percent greater when heterogeneity was considered. Bryan says these findings are generalizable across the Northeast because forests there and in the Midwest are similarly a mix of broadleaf and northern needle-leaved trees growing in cooler latitudes. But he cautions that while this model is more complex than its predecessors, it's not clear whether the added complexity improves the simulation of forest chemistry. "However, we now know that forest chemistry simulations are very sensitive to how forest structure is represented in models," he adds.